The foundation for Hale TiP services begins with our Revit modeling. We bring complete Autodesk expertise to the table for all disciplines: Architectural, Structural, Mechanical, Electrical, Plumbing, and Fire Protection. Our strength is in the fact that we are active project participants, not just consultants, allowing us to practice what we preach and develop long-term business relationships with our clients. It all starts with proper planning and the establishment of a BIM Project Execution Plan (PxP). 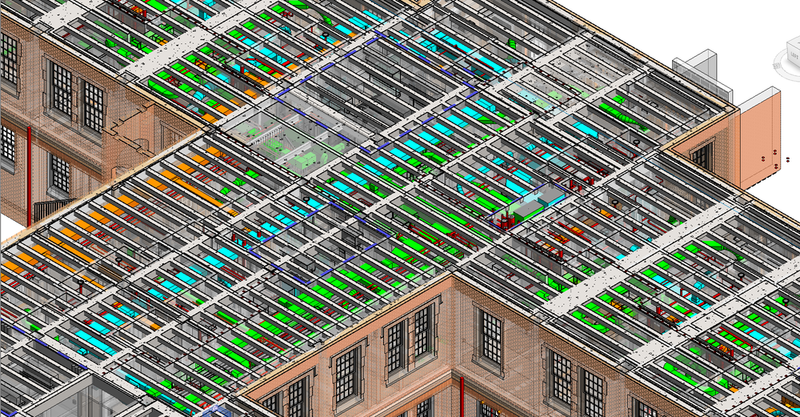 We can design from scratch or convert 2D drawings into 3D building information models (BIMs). Virtually assembling a building before construction facilitates the savings of both time and money. Simple models can be created for clash detection or complex models can be established for quantity takeoffs, coordination drawings, and facility management. Once the BIMs for all disciplines are accurately created, Hale TiP performs clash detection and generates reports for the team to review. Our staff works together with architects, engineers, general contractors and various trades to detect and resolve the design conflicts among construction elements before construction dollars are ever spent. The coordination meetings are run using Autodesk® Navisworks Manage® Software. This software is the industry standard for precise collision detection and clash reports. Multiple CAD and/or BIM platforms can be imported into a single file, stripping down the base geometry to keep the file lightweight. We upload each report by trade for all parties to see, then document the issues and update the project schedules.